Penitent’s Rest, also known as Alikandra Lat, is a remote wilderness temple, named after a paladin seduced to the side of evil, who journeyed to this far-away place to atone for her sins. To this day, the temple is the goal of repentant pilgrims seeking redemption – and it is said, as mentioned in the lore provided, if the PCs do their research, that the paladin’s spirit still shows herself to those praying at her cenotaph, sometimes possessing willing supplicants for quests of utmost importance. This would btw. be one of the 6 events provided and, as often, whispers and rumors are provided. As a pilgrimage site, it only makes sense that there is a fluctuating array of people coming through, with a total of 11 penitents coming with fluffy write-ups – and each one can act as both dressing and as a further adventure hook. It should also be noted that the pdf sports brief notes on the daily life at this place, as well as full stats of aforementioned ex-paladin ghost alongside extended NPC-info: I.e. with appearance, distinguishing features, mannerisms, etc. A detailed account of her fall has similarly been provided for the GM’s convenience. Editing and formatting are generally top-notch, I noticed no significant hiccups. Layout adheres to RSP’s elegant 2-column b/w-standard and the pdf features some nice b/w-artworks. The pdf comes in two iterations, one optimized for screen-use and one made for the printer – kudos there! The cartography by Simon Butler and Dyson Logos is very good. I think by joining Raging Swan Press’ patreon, you can actually get the high-res map for the evocative place, but I am not 100% sure. The map provided in the pdf is cool, but sports keyed rooms. Jacob W. Michaels’ Penitent’s Rest is a nice place of sanctuary you can easily drop in just about any wilderness environment; it makes for a nice, easily inserted location with some solid options for crafting further adventures from. At the same time, the location, while easily inserted in just about any context, also, by virtue of its more general theme, doesn’t make for a strong anchor; it’s more a place to pass through or to catch one’s breath in the deadly wilds and does that job well. Still, personally, I didn’t get that much out of the place – I can and literally have made such a location myself before. My final verdict will clock in at 3.5 stars – experienced GMs may wish to round down, while time-starved GMs should round up. In the end, I believe a unique angle could have helped the location and provide a proper unique selling proposition…you know, loci, unique enchantments, the like. Hence, my final verdict will round down. You can get this location here on OBS! 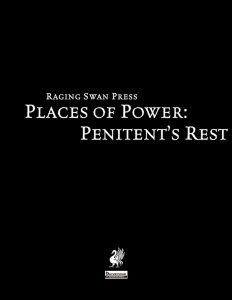 You can directly support Raging Swan Press here on OBS!